The Hayward Lakes Area is the place for fish enthusiasts! We have over 55,000 acres of lakes, and we are home to the Freshwater Fishing Hall of Fame. It's easy to find-just look for the four-story musky, where you can look over Hayward standing in the mouth of the big fish. We also pride our home for its approximately 300,000 acres of forest. The Chequamegon National Forest alone is 124,000 acres. We have over 200 miles of marked and mapped off road bike trails, plus prime single track. Several of the CAMBA trails are open to winter biking. The International Mountain Bicycling Association (IMBA) designated the CAMBA trails a Bronze Level Ride Center. Over 200 miles of maintained ATV trails and 600 miles of groomed snowmobile trails. In the summer, join us in the Golf Capital of Wisconsin. We have several of the midwest's finest golf courses! Our region has over 300 lakes, including the 17,000 acre Lake Chippewa Flowage and its 200 miles of undeveloped shoreline. Wisconsin’s largest wild lake. Lake Chippewa Flowage is the original home of Louie Spray’s World Record Musky at 69 pounds, 11 ounces and 63 ½ inches long. We are also home to Wisconin's only Quiet Lakes; Lost Land Lake, Teal Lake and Ghost Lake. Three sparkling gems set deep in the unspoiled Chequamegon National Forest. No tubing, jet or water skiing. 10 mph only. The rivers, both large and small, offer slow-moving tranquility to fast-paced rapids. You could canoe or kayak a different stretch of our pristine waterways every day! The Hayward Lakes Area boasts FIVE world class events. The American Birkebeiner held every February is the largest cross-country ski race. The Lumberjack World Championships brings contestants from all over the world to compete in chopping, bucking, sawing, speed climbing and boom run. LCO Honor the Earth PowWow is the largest traditional PowWow in North America. 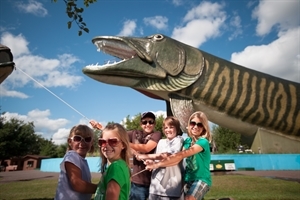 Musky Festival attracts anglers from all corners of the world to participate in the fishing contest. The Hayward/Cable area is home to the largest off-road bike race in North America, the Chequamegon Fat Tire Festival. But there is more to Sawyer County than woods, waters and world class events. Hayward, the county seat, is a city with medical facilities and affordable housing. Not to forget the wide variety of dining and shopping. We welcome you to our northwoods hometwon! Hayward offers so much to see and do. Area attractions welcome you to enjoy a variety of activities. Our shopping district consists of numerous specialty shops, and you’ll be sure to enjoy a relaxing, fun, distinctively different shopping experience. You will surely enjoy our area’s unique spots! Visit the Fresh Water Fishing Hall of Fame, journey through Wilderness Walk, enjoy a Lumberjack Show, canoe or kayak down the river, horseback our beautiful forests with area stables, stop at the casino for gaming or a live show at the park theater, shop the flea and farmer's markets, listen to live music at several locations, take grandkids mini-golfing or to the go-cart tracks. Play one of the golf courses in the “Golf Capital of Wisconsin”. There’s so much to do and see. Try a class or two with several education opportunities with WITC-Wisconsin Indianhead Technical College from beginning gardening to painting waterfalls. Pick between four movies at the Hayward Cinema. If it's power sports you enjoy, ride over 200 miles of maintained ATV trails or snowmobile across 600 miles of groomed and marked trails. CHARAC (pronounced chair-ack), was formed in 1996 by a group of artists and individuals interested in promoting the arts in our region. Its genesis came from the Chequamegon Fine Arts Festival that had been held at Telemark beginning in 1992. Beginning in 1999, the council began awarding scholarships to graduating high school seniors; sponsored its very first art exhibit at Northwoods Health Center; held the first Namekagon Art and Music Festival in Seeley, and the First Annual Dinner. From 2000 to the present, CHARAC has sponsored art events and activities by Northwoods Strings; 2nd Sunday Poets; WOJB concerts; Chequamegon Children’s Theater; Serendipity Players; and of course, the Park Theater Project. The Stone Lake Historical Museum is open Fri, Sat and Sun at 11 am -3pm from Memorial Weekend through early October. Admission is free. The Sawyer County Historical Museum is open Mon- Sat at 10 am -4 pm from June through September. Winter hours are Thursdays 10 am - 4 pm Admission is free. The Sherman and Ruth Weiss Community Library opened its doors in June 2007. Library's resources include books, movies, audios, wireless internet, public computers, community meeting room for 40, education, children's summer reading program, book signings, a nature park connected to the walking and biking trails. Wheelchair-accessible and adaptive and assistive equipment. Hours: Mon-Wed_fri 10 am - 5 pm and T-TH 10 am - 8 pm. Sat 10 am -3 pm. The Senior Resource Center offers bus service and transportation to seniors. Available Mon-Fri, an accessible/equipped bus for 55+ or disabled travelers. Bus stops at grocery stores, medical appoinments, banks, the senior center, hair appointments, etc. Taxi service. The nearest major airport is in Minneapolis, MN about 2 hours and 45 minutes from Hayward. The Hayward Area Memorial Hospital is a 25-bed critical access hospital for all your urgencies and emergencies. We have several assisted living facilities and three independent clinics; Essentia Health, NorthLakes Community Clinic and Marshfield Clinic. Jan -1.9 F° 8.4 F° 18.7 F° 1.1 "
Feb 3.8 F° 14.7 F° 25.6 F° 1.0 "
Mar 18.5 F° 28.1 F° 37.8 F° 1.9 "
Apr 29.9 F° 40.9 F° 51.9 F° 2.6 "
May 40.8 F° 54.3 F° 67.8 F° 3.3 "
Jun 51.0 F° 62.8 F° 74.5 F° 4.5 "
Jul 57.7 F° 68.3 F° 79.0 F° 4.8 "
Aug 55.5 F° 65.8 F° 76.0 F° 4.7 "
Sep 44.2 F° 55.3 F° 66.4 F° 4.4 "
Oct 33.5 F° 44.1 F° 54.8 F° 3.3 "
Nov 21.4 F° 29.1 F° 36.8 F° 2.1 "
Dec 6.7 F° 15.4 F° 24.1 F° 1.0 "
Spring is the exhilaration of nature re-awaking. It is the piercing call of the loon announcing his presence and the water-skimming dance of his mating ritual. Summer in the northwoods is the joy and freedom of families at play. In the fall the forest colors change from the greens of summer to reds, oranges, yellows and browns as the rapidly shortening days and frosty nights produce a riot of color. Winter is breaking trail through virgin powder on a crystalline lake with your snowmobile. It is crisp, clean air and glittering trees as you glide through the pristine forests on skis. It's the solitude of relaxing over your favorite ice hole, keenly waiting the lunker you know is down there. Condos Over 50 Communities Rental units, vacation homes, single-family dwellings, assisted living, apartments, duplexes, multiplexes, seasonal homes, RV parks, nursing homes, and condos. Home care Senior center Visiting nurses The Senior Resource Center offers transportation, bus service, tax preparation, activities, support groups and benefits. There are several civic and community groups to choose from as well. Community volunteer opportunities include Northwoods Humane Society, Hayward Area Memorial Hospital, 4-H, Lions and Lioness Club, Rotary, Library board, school board, Friends of the Library, First Lutheran Wednesday Night Community Supper, Hayward Food Shelf, Meals on Wheels, Regional Hospice, Habitat for Humanity, and several more.